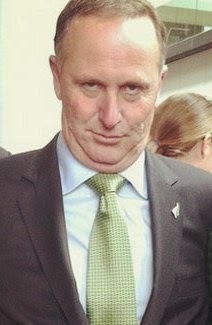 The PM John Key today hastily convened a press conference outside the Number One Men’s Toilet facility in Shanghai to address reporters’ questions concerning his involvement in the Milkgate Scandal. John Key explaining his involvement with Oravida. And at that, the news conference was abruptly terminated as the PM turned and headed into the men’s. ‘The PM did ask me to tell you all before you leave,’ said an aide, ‘that he neither endorses nor does not endorse Oravida milk products, although he also wanted me to say that he drinks Oravida milk every day and counts himself among the blessed of this earth to be able to do so. Thank you ladies and gentlemen.’ With that, we were all given our very own little goody-bags, each containing Oravida milk powder, Oravida milk supplement, the Oravida-patented milk laxative, an Oravida cap, an ‘I YOravida’ t-shirt and an Oravida coffee mug. With so much spilt milk around, however, there's surely more to come on this story.